The 36 hole index wheel is fixed to the spindle by set screw. When doing ornamental work he head is stock is prevented from rocking with a rod connecting the headstock to the rear rubber platform. A quick release fitting on the headstock allows easy locking and unlocking. The side of the index wheel toward the chuck and the vernier holes are used to secure the spindle in any of 360, or one degree, positions. This results in 0.017" positioning ability on an 2 inch diameter work piece. Smaller increments can be adjusted with the rubber or cutter height if necessary. The one degree vernier adjustment works exactly like the "spin index" tool commonly used in metal working. 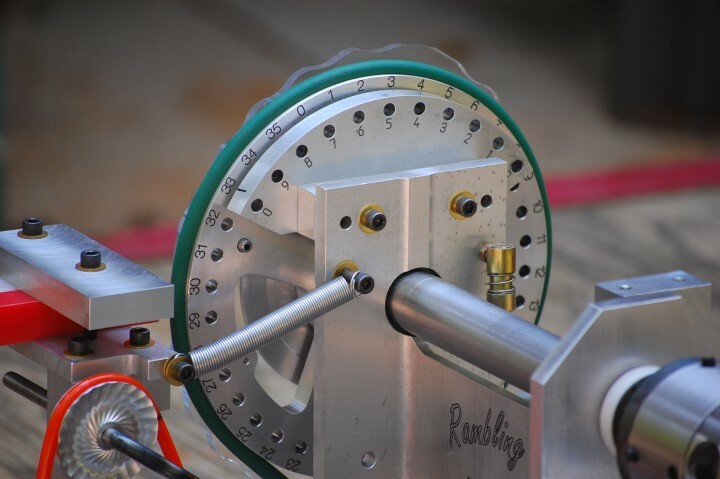 Each Rambling Rose Engine custom rosette cam has 1/3 and 1/8 phase alignment holes drilled either 1/4" or 1/8". The index wheel has both 1/8" and 1/4" cam index holes in a 6" diameter to accommodate Jon Magill's MDF cams and other custom rosette cams. The rosette cam can be repositioned in repeatable increments (phases) of a cam lobe phase in relation to the work. Some custom Rambling Rose Engine cams also have 20 vernier holes allowing the rosette cam to position in any of 720 or 1/2 degree positions in relation to the workpiece when doing Rose Engine work.